On today’s episode of the Your Home Story Podcast, we are taking a deep dive into talking about Powder Bathrooms. We are chatting about how to design, then makeover (or completely gut) and then how to use powder bathrooms. If you look closely, above, you’ll see that the bathroom is small, YET is not a powder bathroom. 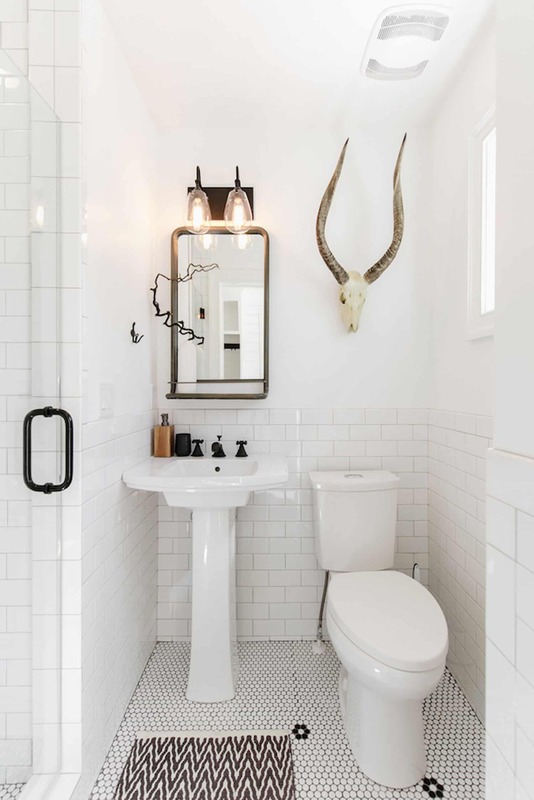 It looks like there is a shower to the left but I love this image so much and it’s such a tiny bathroom that I’m using it for my powder bathroom inspiration today. You get it, right?! I think that a powder bathroom is a great place to start when you are looking to update a space. Because powder bathrooms are small, you can really make a big impact without spending a lot of money or a ton of time. Listen in, today, as we chat about how powder bathrooms can function (I’m talking about you pedestal sink) and how to make them work for you. We’ll walk you through the elements that you can change in a powder bath to update it, from most to least intense/expensive: cabinet/vanity, flooring, backsplash/wall, lighting, mirror, paint, and decor.